Including feet and horses, practically every form of transportation has its mild version, that is, the car that was designed to appeal to the most people. That being said, stock vehicles aim to be as non-descript as possible, not overly flashy, loud, powerful, or special. After all, if an automaker wants to make a car that will sell to the majority of people, it can’t really afford to go too crazy. True, there are some “special” cars out there, such as the Lexus LFA, which specializes in being powerful and twitchy, but it also sold for $375,000, only 500 were ever produced. The run-of-the-mill made-to-offend-no-one Toyota Corolla, however, sold more than 1,100,000 units last year alone! On the other hand, for those who want something a little more unique, there is the wild version, that is, a car customized to reflect the driver’s personality, favorite cartoon character, or whatever else they like. If there’s a single word that sums up the Japanese custom car scene, it would have to be “everything,” because you can find practically everything in Japanese car shows, and what’s the point of it all, but to have fun and show off a little bit? Taking a look at some of the designs, it’s clear to see that some eccentric minds have been let loose on the drawing boards, featuring exaggerated elements and flashy styling. But where do the original ideas come from? Here are a couple of Japanese custom car styles and modification elements that tend to stand out among the crowd. “Kaido” translates literally from Japanese to mean “road or highway,” but may also refer to an Aires-type personality, that is, someone energetic and impulsive. A fitting homage to the silhouette racers of the late 1970s and early 1980s, Kaido Racers start with stock vehicles, but much of that resemblance fades as modifications range from the mild to the insane. The Kaido Racer’s shark-nose, chin spoiler, and wide fenders are exaggerated, giving the appearance of a larger car and, ostensibly, improving aerodynamic performance, downforce, and traction. An exposed engine oil cooler is a classic Kaido modification, as are the stretched tires on super-wide rims, which the wide fenders are designed to barely cover. Still, most of these Kaido Racers look like something that you could still get around town without attracting a whole lot of attention but, once the modifications go beyond exaggeration, we get into Bosozoku territory. “Bosozoku” translates from the Japanese most closely as “violent run tribe,” and was the name of a Japanese biker gang that was at its height in the 1960s and 1970s. The Bosozoku stemmed from the “kaminari zoku,” or “thunder tribes,” which had their start back in the 1950s. Generally made up of disillusioned youths, as most gangs are, Bosozoku gangs rode around on loud motorcycles, typically illegally modified, disrupting traffic and daily life of “common” folk. While Bosozoku gangs have since become more docile, their styling and attitude have lived on in Japanese custom car styling best known as Bosozoku Style. Where Kaido Racers still seem to be well-suited as daily drivers, Bosozoku Style cars are definitely suited for car shows because of their wildly exaggerated features. Of course, you’ll still see Bosozoku Style cars at weekend meets, bars, and the occasional highway tour. The original Bosozoku Bikes features oversized front fairings, wild paint jobs, illegally-modified exhaust systems, but weren’t to be outdone by the riders’ costumes themselves. Bosozoku Riders were often tattooed, wore stylized coats inspired by Samurai and WWII garb, typically carried wooden katana swords, and rode without helmets. Bosozoku Style cars, continuing the outlandish tradition of exaggerated elements, feature Kaido Racer spoilers extended beyond reasonable limits. Front chin spoilers, for example, typically never exceed a few inches in length, and rear spoilers and wings may rise just a few inches over the rear deck. 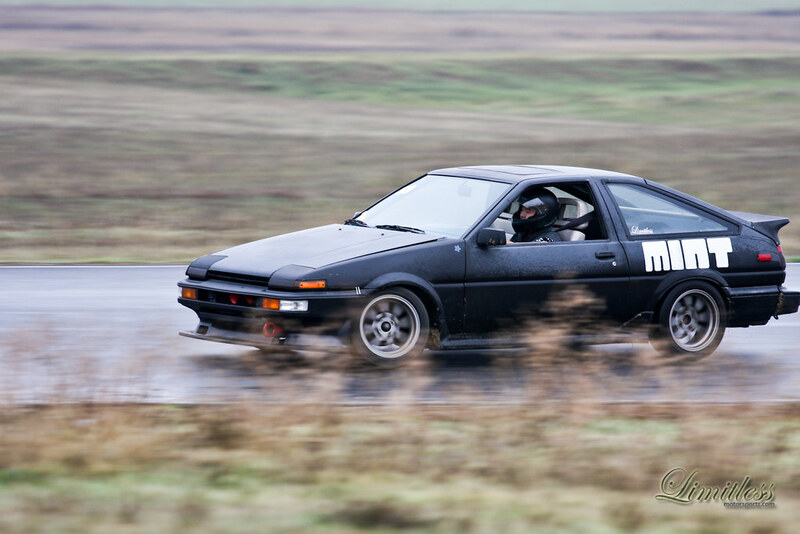 Bosozoku Style chin spoilers may extend a few feet in front of the car and rear deck spoilers may exceed a few feet in length, rising far above the height of the car! Finally, who can forget to mention Takeyari-style exhaust! “Takeyari” literally translates from the Japanese as “bamboo spear,” and the resemblance between an oblique-cut bamboo spear and Takeyari exhaust is unmistakable. Instead of simply allowing engine exhaust to escape from nearly-hidden exhaust ports, takeyari exhaust pipes come in every shape and color, chrome, steel, or painted, and rise to great heights behind the vehicle. Some Takeyari exhaust pipes feature zig-zag bends, star-shaped pipes, double-, quadruple-, or even duodecuple-port exhaust systems. That last one refers to a dozen exhaust pipes, which is a pretty wild number of exhaust pipes to see coming out the back of a classic Fiat! Oh yes, forgot one thing, and this will be hard to miss, unless you happen to be deaf. Japanese Sound Cars, while surely spending a lot of time on exterior appearances, have gone above and beyond anything remotely useful in their audio systems. Starting with the car’s electrical system, Sound Car guys beef up the voltage and amperage output, adding additional batteries, alternators, and capacitors to handle the extra thousands of watts of a fully custom sound system. 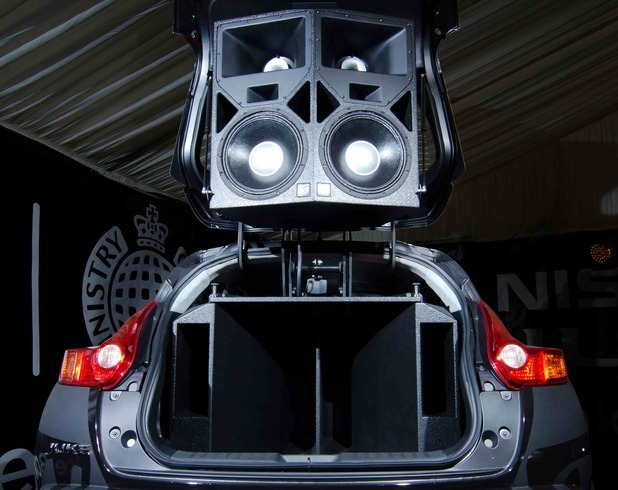 In fact, one of the most powerful Sound Cars in the world was produced by a collaboration between Nissan and Ministry of Sound. The heavily-modified Nissan Juke, known as the Juke Box, boasts 18,900 W of stereo system and can generate 150 dB of sound, which is louder than a commercial jet at take-off. Far from sticking to extra amplifiers and speakers, Japanese Sound Cars feature fully-custom interiors, often replacing back seats and interior panels with custom speaker enclosures and multicolor LED and neon lighting. Truly, a sight and sound to behold! Walking through a Japanese Custom Car show is much like delving into the pages of a car-based Manga or Anime series, and every car is as unique as its owner. From the mild just-over-stock restorations to the wild paint and vinyl jobs, not to mention oversized everything, each work of art speaks volumes about a rich history of custom cars and smacks of just a little bit of rebellion. Keep in mind, however, that it’s beneath no one, especially Japanese custom car owners, to mix and match the styles to their liking. Practically the only limit is perhaps the owner’s imagination and the depth of his wallet.